The singer, dancer, actress and mom made a promise to herself to get into the best shape of her life — and she kept that promise. 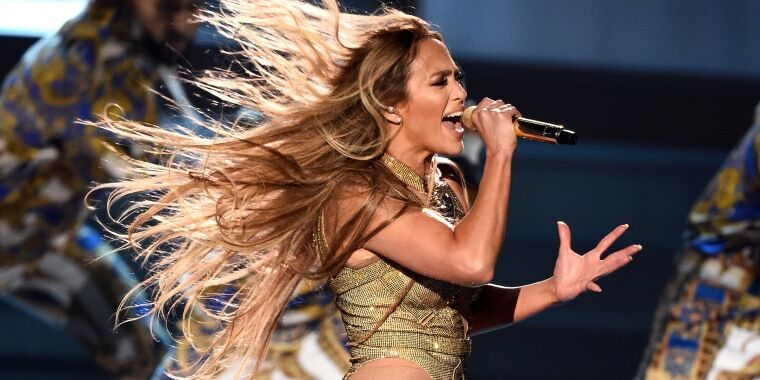 Jennifer Lopez has had a grueling stage schedule this month as she approaches the end of her "All I Have" Las Vegas residency, with concerts booked every other day — and sometimes more often. But a "superwoman" photo she shared on Instagram Wednesday proves that her gym schedule must be just as grueling. "Feeling like superwoman after the show tonight!" she wrote alongside the beautiful and powerful image. "When I started this run I thought omg 15 shows in 27 days that’s a lot... but I made a promise to myself that instead of letting it wear me down I would be even stronger at the end of it." Her vow was a simple one: "I will work out and be in the best shape of my life." "There were moments I was tired and there was travel and I had to fit in my workouts where I could... but here we are with only 3 shows left!!" she continued. "And I am having so many emotions but mostly just feeling strong, happy and grateful!!!" The 49-year-old mother of two added several hashtags to the post, including the inspiring message urging fans to "#makepromisestoyoursellfandkeepthem" — just as she's done for herself. And J.Lo isn't the only one celebrating her hard work. Her boyfriend, Alex Rodriguez, has also posted videos from their shared workouts and photos recognizing her hard-earned success. But as impressive as her gym gains are, it's the changes she's made on the inside that Rodriquez noted when he penned a birthday message in her honor in July. "When we were kids, birthdays were exciting because it was all about the gifts we would be getting. A new bat, dance shoes, maybe a new CD (yes I’m old! )," he wrote. "I see firsthand how that’s changed for Jennifer, and how she’s found joy in sharing with others. For someone who has been about giving everything she has 365 days a year — to our children, our families, the world — I hope today, we can give you all the happiness you deserve."